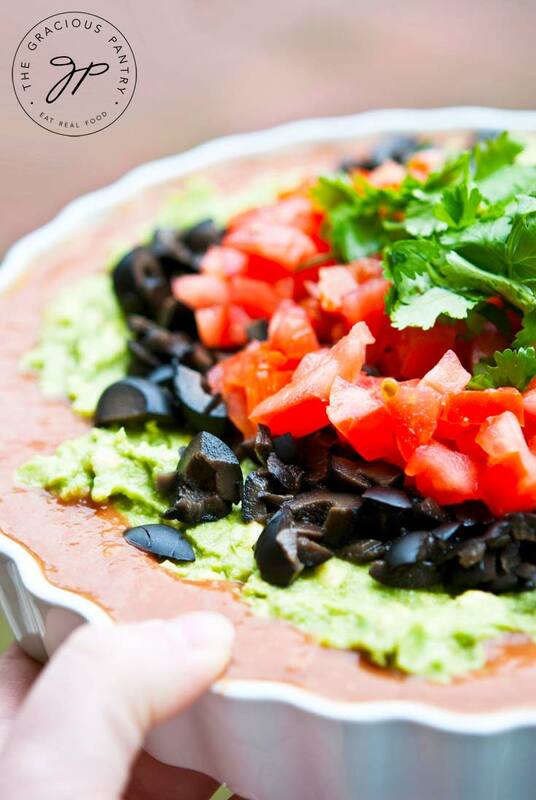 This delicious, clean eating TexMex dip is perfect for your next get-together! Maybe I’ve got spring fever, or maybe I just love Mexican food. Or maybe it’s a combination of both. But I started thinking about having barbecues this summer and thinking about what types of things I could serve as appetizers for entertaining friends. Mini Chef is already begging for barbecues and trips to the beach and pool, and I can’t blame him. He’s been in the house much of the winter due to one cold/flu or another. (They seem to bring home a new illness every week when they start school). So I guess you could say that both of us have a serious case of spring fever. I’m actually looking forward to summer for the first time in my entire life this year (that California heat is starting to win me over) and I want to enjoy some delicious foods in the process. So I thought a dip would be a yummy way to start things off. The serving size is small on this because it’s meant to be more of a party dip. And I don’t know about you, but 1/4 cup of dip at a party seems about right to me unless you’re totally pigging out. But double to a 1/2 cup if you like. Just remember to double the nutrition data as well! A delicious dip your entire guest list will enjoy! Combine the beans and the salsa in a pot and warm while stirring constantly. Once they are warm and well combined, remove from heat and pour the beans into your serving dish. Make your guacamole using the avocados, lime juice, garlic powder and onion powder. Add salt to taste. Layer the guacamole over the beans. Top with olives and tomatoes next and finish with the fresh cilantro. Serve with your favorite, clean corn chips or whole grain crackers. Jean – Ya, summer is calling my name this year! Especially the pool. LR – I hope you enjoy them all! Tara – I hope you enjoy it! We are having a get together this weekend and I cannot wait to get to make this for our friends…and the best part…it’s healthy!!! Melissa – I hope everyone enjoys it! Tiffany- I just made this and omg it was soooo good! It was super easy to and a great dip for party’s. I think I might take some to school for my coworkers to munch on during our planning. Alyce – Fantastic! I’m glad it was a hit! To the best of my knowledge, olives are fine. 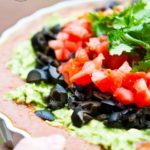 This would also be great topped with plain greek yogurt, just like sour cream! I cannot wait to make this!!! I guarantee my family will inhale it!! And yes, I will have to add the plain Greek yogurt for the element of sour cream!! ??? ?